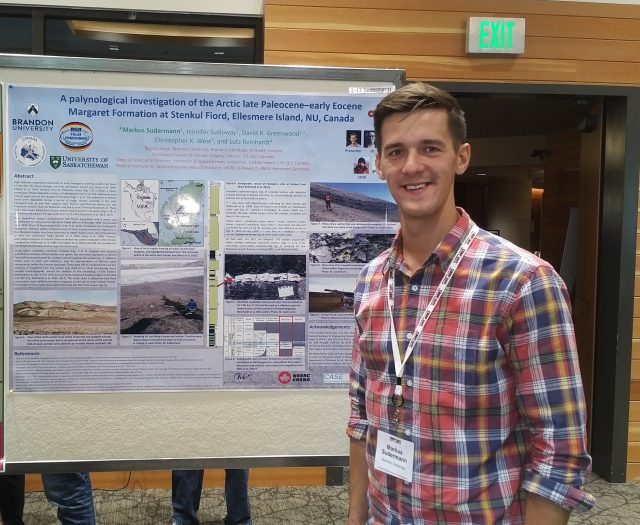 Brandon University student Alex Lowe poses in front of his poster with one of the organizers of the Climatic and Biotic Events of the Paleogene 2017 conference, Dr. Gabe Bowen of the University of Utah. BRANDON, Man. 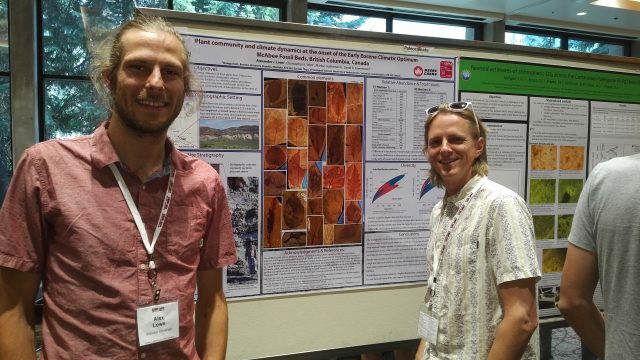 – Brandon University (BU) was represented by Biology Professor Dr. David Greenwood and his graduate students at a recent international scientific conference in Utah. Markus Sudermann poses with his poster at CBEP2017. Greenwood was joined at the Climatic and Biotic Events of the Paleogene 2017 conference (CBEP2017) by Markus Sudermann and Alex Lowe, students in BU’s Master of Science (Environmental and Life Sciences) program (MELS). About 125 scientists, from graduate students to some of the world’s top experts in ancient climate reconstruction, converged on Snowbird Meeting & Conference Center near Salt Lake City, to discuss the dramatic transitions that took place on the Earth during the Paleogene Period, which began 66 million years ago, just after the extinction of the dinosaurs, and spanned about 43 million years. Sudermann and Lowe both presented posters on their research projects. Sudermann’s research involves an investigation of the Margaret Formation on Ellesmere Island in Nunavut, which dates to the late Paleocene-early Eocene epochs (57 to 53 million years ago). Lowe is studying the McAbee Fossil Beds in British Columbia to learn about the plants and climates of the early Eocene Epoch. Greenwood and his PhD student, Christopher West (University of Saskatchewan) both gave oral presentations on their research as part of the conference. Greenwood was part of the scientific committee for CBEP2017. and Christopher West, right, split shale to find fossil fish in Wyoming. 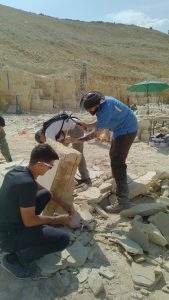 Following the conference, which took place from September 4 to 8, Greenwood and his students made a field trip to Wyoming. There they visited quarries that mine fossil fish sold in rock and souvenir shops across North America. The research and conference participation of Greenwood and his students were supported by a Discovery Grant from the Natural Sciences and Engineering Research Council of Canada (NSERC) awarded to Greenwood as well as NSERC scholarships to Sudermann and West, and utilizes Greenwood’s Canada Foundation for Innovation funded research laboratory. For more information on CBEP2017 visit cbep2017.utah.edu. 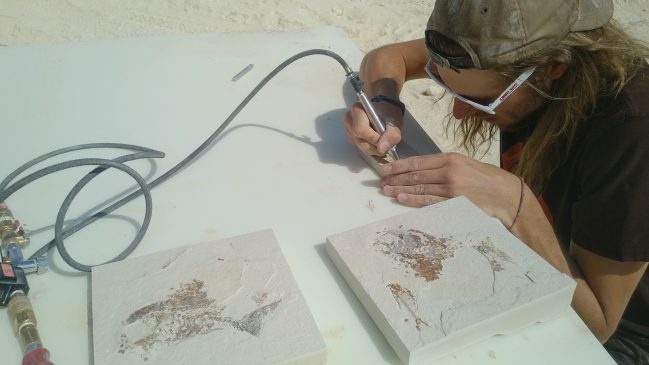 Alex Lowe uses an air-scribe to better reveal a fossil fish he had just collected in Wyoming.